Myrtle Beach, SC, 2015-5-15 — /Travel PR News/ — Wyndham Vacation Rentals®, the world’s largest professional manager of vacation rentals and part of the Wyndham Worldwide family of brands (NYSE: WYN), is celebrating the grand opening of the Bali Bay community in Myrtle Beach by offering guests 7 nights for the price of 3 this summer. This special offer is available on stays through August 27, 2015, using the promotion code BALIBAY. 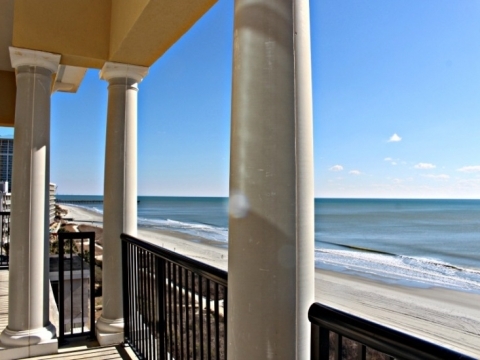 Wyndham Vacation Rentals markets, maintains and manages property rentals for Bali Bay, which offers 21 unique, upscale vacation residences in Myrtle Beach. With its oceanfront setting and convenient south-end location, Bali Bay provides easy access to Myrtle Beach attractions like the Family Kingdom Amusement Park and Broadway at the Beach. Guests at Bali Bay can enjoy access to an oceanfront infinity pool, oceanfront deck, gated parking and an on-site restaurant with outdoor seating (opening early summer). The three, seven-bedroom penthouse residences will also include a pool table and bar area for entertaining. Bali Bay is finishing construction and scheduled to be complete in early summer 2015. To take advantage of Wyndham Vacation Rentals’ Bali Bay promotion, guests should call 877-869-5962 and mention promo code BALIBAY. Availability is limited, and reservations must be booked directly with Wyndham Vacation Rentals Myrtle Beach by May 30, 2015. More details, including terms and conditions, are available online. For more information about Wyndham Vacation Rentals, visit http://www.WyndhamVacationRentals.com. Wyndham Vacation Rentals, the world’s largest professional manager of vacation rentals, is part of Wyndham Exchange & Rentals and the Wyndham Worldwide family of brands (NYSE: WYN). Backed by one of the world’s largest hospitality companies, Wyndham Vacation Rentals provides access to approximately 103,000 vacation rental properties in more than 550 unique destinations worldwide. Wyndham works closely with property owners to ensure all rentals meet its standards for customer service, quality and comfort. More than 25 regional rental brands fall under the Wyndham Vacation Rentals umbrella including Hoseasons, James Villa Holidays, Landal GreenParks®, Novasol, and ResortQuest ®. Through this collection, Wyndham delivers distinct vacation experiences ranging from beachfront condos, private homes and villas to castles and houseboats. Many properties offer kitchens, washers and dryers and other home-like conveniences along with maid service, spas, fitness centers, and golf courses. For additional information visit our media center or wyndhamvacationrentals.com. Also find us on Facebook, Twitter, Pinterest and Google+. This entry was posted in Hospitality, Hotels, Travel, Travel Management, Travel Services and tagged Bali Bay community in Myrtle Beach, Kim Sanborn, Wyndham Vacation Rentals®. Bookmark the permalink.